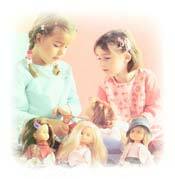 Corolle's Les Cheries Chloe Ballerina Doll is a darling toy for girls who like to style their dolls. Not only does Chloe look pretty in her removable pink ballet attire, but her versatile mane can be shampooed and groomed into endless hairstyles. Designed for ages 4 and up, this award-winning toy will inspire your daughter's ballet en pointe and demi-plies while speaking to her inner, budding stylist. Chloe is a brunette ballerina with a head of thick, rooted hair and blue grey blinking eyes. She stands at 13 inches tall and has an easy to maintain all-vinyl and poseable body. Like real-life ballerina girls, her form is smooth and soft-edged, yet rigid enough to withstand the pirouettes and side leaps of your girl's imaginative play. Chloe is outfitted in a delicate yet durable pink outfit that includes a sparkly headband, satiny body suit, tulle tutu, fishnet leotard, and precious lace-up ballet slippers. Chloe will be ready for the recital after you pull her out of the box and remove the protective elastic bands from her hair. This ballerina's finely detailed outfit is well constructed and machine washable for easy cleaning. The tulle skirt fastens with a simple Velcro tab. The ballet slippers come attached to Chloe's body suit by threads that you can cut off when you're ready to change Chloe or wash her outfit. As with all toys for preschool-aged children, you'll want to snip excess threads yourself and dispose of the elastic bands before handing Chloe over to her stylist and dancing partner. One of Chloe's most interactive features is her ready-to-style hair. Your girl has options in addition to brushing, braiding, or piling this ballerina's mane into a traditional bun. Chloe's vibrant hair can be shampooed, rinsed, and blow-dried, and can take curling or straightening irons on low settings. Styling Chloe's hair is a fun way for your child to experiment and gives you an opportunity to teach her some lessons in grooming and caring for her own hair. Corolle's Les Cheries Chloe Ballerina Doll is the winner of a Best Toy Award from Oppenheim Toy Portfolio, an independent consumer review group of children's media. Created by mother-daughter child development experts Joanne and Stephanie Oppenheimer, this media review group bestows Platinum Awards to the most engaging and innovative children's products each year. One 13-inch doll with ballerina outfit.